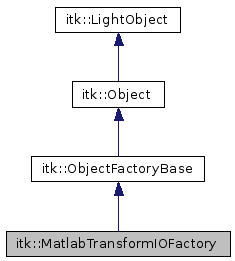 Create instances of MatlabTransformIO objects using an object factory. Definition at line 33 of file itkMatlabTransformIOFactory.h. Definition at line 40 of file itkMatlabTransformIOFactory.h. Definition at line 39 of file itkMatlabTransformIOFactory.h. Definition at line 37 of file itkMatlabTransformIOFactory.h. Definition at line 38 of file itkMatlabTransformIOFactory.h. Create and return all possible instances of the named itk object. 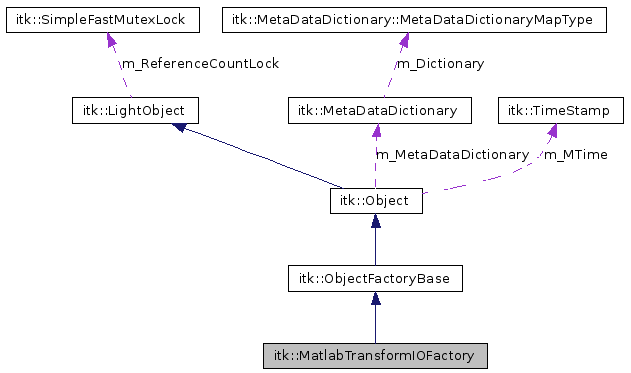 Each loaded ObjectFactoryBase will be asked in the order the factory was in the ITK_AUTOLOAD_PATH. All created objects will be returned in the list. Create and return an instance of the named itk object. Each loaded ObjectFactoryBase will be asked in the order the factory was in the ITK_AUTOLOAD_PATH. After the first factory returns the object no other factories are asked. Referenced by itk::ObjectFactory< T >::Create(). This method is provided by sub-classes of ObjectFactoryBase. It should create the named itk object or return 0 if that object is not supported by the factory implementation. Set all enable flags for the given class to 0. This will mean that the factory will stop producing class with the given name. Return a list of descriptions for class overrides. Return a list of classes that this factory overrides. Return a list of the names of classes that override classes. Return a descriptive string describing the factory. Get the Enable flag for the specific override of className. Return a list of enable flags. Class methods used to interface with the registered factories. This returns the path to a dynamically loaded factory. Return the list of all registered factories. This is NOT a copy, do not remove items from this list! Referenced by itk::TransformFactoryBase::GetFactory(), itk::SpatialObjectFactoryBase::GetFactory(), itk::VTKImageIOFactory::RegisterOneFactory(), itk::VoxBoCUBImageIOFactory::RegisterOneFactory(), itk::TxtTransformIOFactory::RegisterOneFactory(), itk::TIFFImageIOFactory::RegisterOneFactory(), itk::StimulateImageIOFactory::RegisterOneFactory(), itk::SiemensVisionImageIOFactory::RegisterOneFactory(), itk::PNGImageIOFactory::RegisterOneFactory(), itk::PhilipsRECImageIOFactory::RegisterOneFactory(), itk::NrrdImageIOFactory::RegisterOneFactory(), itk::NiftiImageIOFactory::RegisterOneFactory(), itk::MINC2ImageIOFactory::RegisterOneFactory(), itk::MetaImageIOFactory::RegisterOneFactory(), RegisterOneFactory(), itk::LSMImageIOFactory::RegisterOneFactory(), itk::JPEGImageIOFactory::RegisterOneFactory(), itk::GiplImageIOFactory::RegisterOneFactory(), itk::GEAdwImageIOFactory::RegisterOneFactory(), itk::GE5ImageIOFactory::RegisterOneFactory(), itk::GE4ImageIOFactory::RegisterOneFactory(), itk::GDCMImageIOFactory::RegisterOneFactory(), itk::DicomImageIOFactory::RegisterOneFactory(), itk::DICOMImageIO2Factory::RegisterOneFactory(), itk::Bruker2DSEQImageIOFactory::RegisterOneFactory(), itk::Brains2MaskImageIOFactory::RegisterOneFactory(), itk::BMPImageIOFactory::RegisterOneFactory(), itk::BioRadImageIOFactory::RegisterOneFactory(), and itk::AnalyzeImageIOFactory::RegisterOneFactory(). Register a factory so it can be used to create itk objects. Referenced by itk::TransformFactoryBase::GetFactory(), itk::SpatialObjectFactoryBase::GetFactory(), itk::VTKImageIOFactory::RegisterOneFactory(), itk::VoxBoCUBImageIOFactory::RegisterOneFactory(), itk::TxtTransformIOFactory::RegisterOneFactory(), itk::TIFFImageIOFactory::RegisterOneFactory(), itk::StimulateImageIOFactory::RegisterOneFactory(), itk::SiemensVisionImageIOFactory::RegisterOneFactory(), itk::RawImageIOFactory< TPixel, VImageDimension >::RegisterOneFactory(), itk::PNGImageIOFactory::RegisterOneFactory(), itk::PhilipsRECImageIOFactory::RegisterOneFactory(), itk::NrrdImageIOFactory::RegisterOneFactory(), itk::NiftiImageIOFactory::RegisterOneFactory(), itk::MINC2ImageIOFactory::RegisterOneFactory(), itk::MetaImageIOFactory::RegisterOneFactory(), RegisterOneFactory(), itk::LSMImageIOFactory::RegisterOneFactory(), itk::JPEGImageIOFactory::RegisterOneFactory(), itk::GiplImageIOFactory::RegisterOneFactory(), itk::GEAdwImageIOFactory::RegisterOneFactory(), itk::GE5ImageIOFactory::RegisterOneFactory(), itk::GE4ImageIOFactory::RegisterOneFactory(), itk::GDCMImageIOFactory::RegisterOneFactory(), itk::DicomImageIOFactory::RegisterOneFactory(), itk::DICOMImageIO2Factory::RegisterOneFactory(), itk::Bruker2DSEQImageIOFactory::RegisterOneFactory(), itk::Brains2MaskImageIOFactory::RegisterOneFactory(), itk::BMPImageIOFactory::RegisterOneFactory(), itk::BioRadImageIOFactory::RegisterOneFactory(), and itk::AnalyzeImageIOFactory::RegisterOneFactory(). Definition at line 54 of file itkMatlabTransformIOFactory.h. Register object creation information with the factory. Re-check the ITK_AUTOLOAD_PATH for new factory libraries. This calls UnRegisterAll before re-loading. Set the Enable flag for the specific override of className. Remove a factory from the list of registered factories.